How Are You Going to Power That? 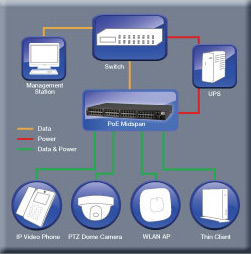 PowerDsine offers a wide range of PoE solutions for any PoE situation. With PowerDsine technology, systems can be enabled to deliver up to 95 watts of flexible and reliable PoE to WLAN access points, VoIP phones, IP cameras, thin/zero clients and other Ethernet devices. Choose a midspan to fit your power budget. As well as being innovators of PoE systems, the PowerDsine brand is an innovator and thought leader in PoE technology and is a major source of 802.3af, 802.3at and HDBaseT standards. While serving as the premier intelligent network power solutions provider, Microsemi's PowerDsine is committed to empower partners’ success through innovative industry leading network power systems and premier partner opportunities. Best-of-Breed PowerDsine PoE midspans bring flexibility and longevity to network upgrades while also offering optimal powering and reducing the overall power profile. As well as being innovators of PoE systems, the PowerDsine brand is a market leader in PoE technology and is a major contributor to both the 802.3af and 802.3at standards as well as the most recent HDbaseT standard. PowerDsine® midspans from Microsemi® enable delivery of up to 60 watts of reliable, scalable Power over Ethernet (PoE) to IP cameras, WLAN access points, Zero Clients, IP phones, and other Ethernet devices over standard Cat5 or better Ethernet cable. Partnerships are vital for success. Microsemi offers Empower - a comprehensive channel partner program designed to educate, inspire and delight our reseller community. Microsemi is committed to empower partners' success by providing industry leading power solutions. Empower strives to help your business success, enabling you to realize success in Ethernet based installations and bring fast, high-powered flexible networks to your customers. In turn, Microsemi believes PowerDsine PoE technology will be empowered to become a top channel product and continue its technology and market leadership in the power business.